The Amtech Planning Board production planning application is an essential communication tool for every department of your organization. The system provides a real-time, graphical display of the entire production process. 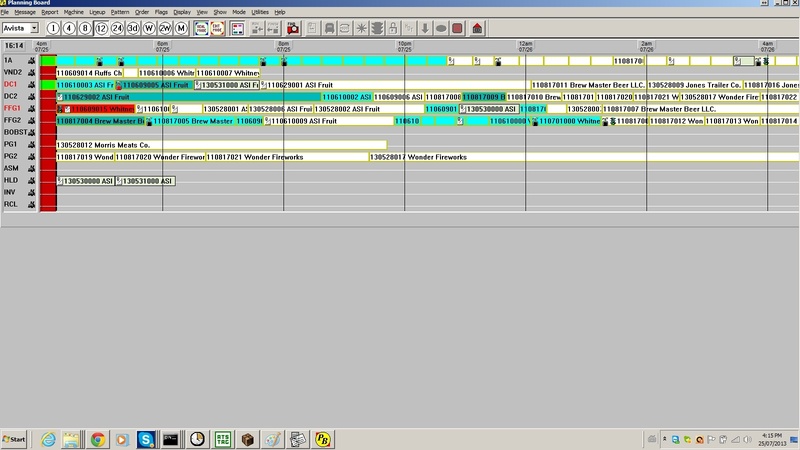 Using a Gantt Chart format, the run sequence, processing time and stock availability is shown for each machine center. Sales Service, Shipping, Planning and Management will be aware of current production conditions at all times. Provides a real-time graphical representation of the order queue for downstream converting. Displays the run sequence, processing time and stock availability for each machine center. Users can see the impact a change in the Schedule will have on the overall plant operation. Lineups can quickly be modified from one location to meet changing production requirements. Orders can easily be re-sequenced or moved between machine centers to balance work. Users can analyze the impact such moves will have on the Corrugator Schedule and develop Converting Schedules that maximize production and meet established delivery requirements. Orders can be flagged with information that is available to all users. A central database insures all users are working with the same information. Using the Planning Board, orders can easily be re-sequenced or moved between machine centers to balance work. These changes to the production plans are instantaneously communicated to all system users. Users can then analyze the impact such moves will have on the Corrugator Schedule and develop Converting Schedules that maximize production and meet established delivery requirements. 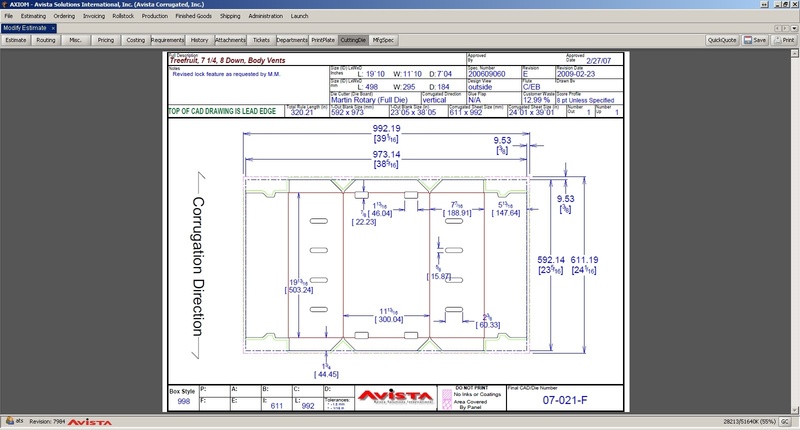 The Planning Board is designed to interface with an Avista Plant Floor Solution database and display the production schedule for all production equipment. The system will be configured prior to installation and start up with each of the manufacturing machine parameters so that it “understands” the manufacturing capabilities and similarities between machines. This allows for an auto distribute feature to evenly distribute orders between like machines and help maintain a balanced work load for each machine center. The Planning Board allows you to view orders already trimmed and at the corrugator or all not scheduled orders in house. A variety of different time-frame views can be accessed. Any blank space indicates there is no order scheduled to run on that machine during that time period. Colors define order and machine status. Colors can be configured to identify orders that are selected, scheduled, running, finished, hot, pending and on-hold. Specific colors can also be used to indicate machine downtime. Downtime can be inserted at any time for preventive maintenance and clean up. All users will be informed of the length of time and the reason for the downtime. Orders with a required shipping date and time entered are flagged with truck icon (Green). If an order with a committed ship date can not make the required ship date due to manufacturing delays, the truck changes from Green to Red. This alerts the users ahead of time and allows them make modifications to the order sequencing so the order can be finished on time. A “drag and drop” feature makes moving and re-sequencing orders Planning Board easy. The system will warn of a problem if an order is switched to a machine where there is a discrepancy between the physical order requirements and the machine constraints. An alternate manual text based machine sequencing method is also available. 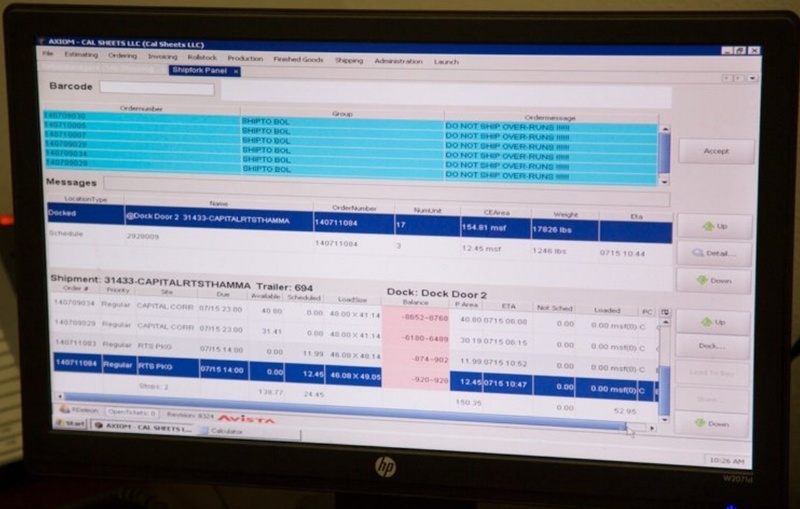 “Edit” and “Real” time modes allow a user to test changes to the plant schedule and see the effect moved or inserted orders will have on the orders already in production. If changes are to be applied, the user can save the changes. If not, the changes can be cancelled and everything returns to the original state. Planning Board users can access detailed information about a specific order including: Order Number, Estimate Number, Customer Name, Container ID, Delivery Date, Flute, Order Quantity, Work in Process and Machine Route. Users can also view detailed corrugating and converting information by clicking on an order anywhere in the lineup and selecting to show the order information. Shipping Information including where the order will be shipped and any special instructions required for the shipment can be displayed for any order. Planning Board supplies numerous reports. The “Hot” order report includes all orders found on the Planning Board that have been flagged as “Hot”. This report displays basic order information and lists the machine centers that the order has completed as well as those that have yet to be processed with the estimated time that the order will be finished at each machine. The “Hot” report can be used during production planning meetings to help plan the orders progress through manufacturing. Planning Board also contains a report which displays all the orders in the planning board by machine and by order status (i.e. : scheduled, or work in process). A user can search the database to locate and return production history details for a selected order. These details include basic order information and the date, time and quantity for the order through every step of its process through manufacturing. Improve your plant with real-time displays of the production process.